There is no one way to fall in love. It happens frequently, and more than once in every life time. In fact, it could easily happen more than once a day. It is a wish for joy, for connection, for growth. It is NOT a need to possess. Since my first “love,” I’ve realized that falling in love and falling in need are two very different things. I am “in love” with many people, for many reasons. I do not covet a single one of them. They don’t validate who I am, or “make” me happy. They are mothers, fathers, sons, daughters, friends and occasionally, people I’ve never actually met. Sometimes “they” can even be a place or an experience. There is something so unique about them, something so precious to me that having them in my life is immeasurable joy. It is often something simple, like the way they laugh, or the way they see the world differently than I do. They contribute to the tapestry that is my life, sometimes in ways I never imagined possible. And falling in love means that I want to enjoy them, and watch as they thrive. I want to talk to them, kiss them, touch them, laugh with them, comfort them when the feel need, but NEVER does it mean that they must give anything in return. In fact, they give simply because they are. You see, “falling in love” is an outpouring of the most generous emotion we humans experience. It impels us to be kind. Look around you every day, and fall in love with something bigger than yourself, something more compelling. It doesn’t mean that you have to stop feeling “in love” with anything or anyone else. If that were true, no parents would ever have more than one child. Anyone who knows me will tell you that I see my loves deeply, that I “know” them and that I encourage their deepest desires. It is who I am, and if I am “in love” with you, you are sure to know it. “Just think of him as a hairy toddler,” said my new friend, Audra. I chuckled thinking about what it was going to be like interacting with a six year old chimp while trying to film a story that illustrates how generous a human heart can be. Of course, I was excited, for a host of reasons. 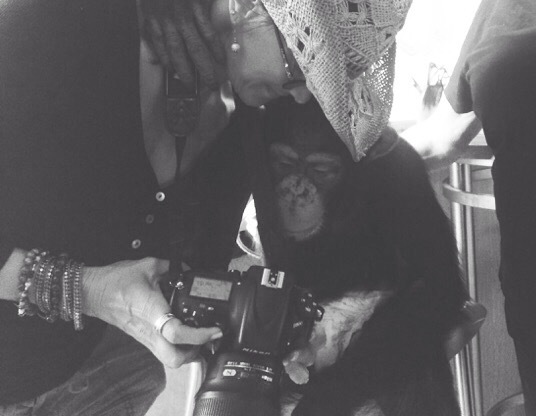 Having never interacted so closely with chimpanzees, I was going to see closeup the emotional lives they lead. I knewthat I was going to be engaged from the moment I began working. But it’s what you don’t know that you don’t know that gets you. I didn’t know that I was going to learn more about what healing looks like and what happens when one of us decides that breaking is only the beginning of a powerful journey. Most of us, at one time or another, have suffered something that brings us close to losing all faith in humanity. But it is how we heal that is the mark of our character. With a lot of hard work, and some very devoted people, we will show you how one woman helps these beautiful creatures heal, and how she heals in the process. It is a story that needs telling because it tells us a lot about ourselves. It teaches us what kindness and communication can do for the broken. It teaches us what being human should look like. Thanks to a constellation of stars achieving an unprecedented alignment, I am involved in this project. One of those stars is a man named Adam Neal Gonzalez, who, I KNEW would be perfect to capture the story on film. It took no time at all for the two of us to get emotionally invested in what Audra is doing with the chimps. I’m not going to sugar coat it and make it sound easy. The animals are beautiful and intriguing. But they are also intelligent, territorial and extraordinarily strong. We keep a respectful distance. It is only because humans are good liars that we hold dominion over these creatures. What Audra does to give them a voice through art is nothing short of beautiful. I can’t wait to share that beauty with all of you. The ottoman struggled across the wooden floor, moved unintentionally as she stretched her entire length, pushing out with her feet. “Ohhhhh” she moaned, feeling her muscles respond. He watched her from across the room, amused at how overwhelming the over stuffed chair looked around her. Challenge piece, a new activity that I am enjoying, in this instance from the voluptuous Dark Night Chronicles . I’m new to writing challenges. It’s a bit daunting, but a whole lot of fun. I started at the corner, because it had already lost its grip. The ridges and valleys spread out before me, arranged in waves shaped like David: long limbs, bent with the bliss of sleep. Just an hour before, he’d warmed the ridges and valleys, after he’d burned his touch onto my flesh. And now, as I bent to pull away the sheet that still held his shape, I paused. At first, one knee, then another, my arms stretching toward the place where his head had rested, gathering and wringing the white cotton, losing myself in the chypre fog. My body called to him, as I wrapped myself in the sheet, and closed my eyes. It would only be a few more hours until he returned, and his force would again heat this now cooled room.